Indiana fourth graders' and eighth graders' average scale scores on the nation's benchmark standardized test both increased. The gains in fourth grade were more substantial in Indiana than in eighth grade. How much has Indiana’s performance on the nation’s benchmark standardized tests changed since their last release in 2011? The answer depends on how much you’re willing to make of just a few points. Indiana fourth graders’ average scores on the National Assessment of Educational Progress exams in both math and reading jumped five points this year, federal education officials announced Thursday. That may not seem like much on the NAEP’s 500-point scale. Still, that’s a bigger jump than all but a handful of other U.S. states saw in fourth graders’ scores. Hoosier eighth graders posted less jaw-dropping scores, but gains nonetheless. Nationally, though, achievement gaps between white, black and Hispanic students remained as stubborn as ever. The country’s overall scores edged up only slightly. Fourth grade reading (the red line on the graph above): Indiana’s average scale score jumped from hovering around the national average on this test two years ago to sitting solidly above-average this year — a result that will no doubt provoke new conversation about Indiana’s controversial third grade reading test. The number of students earning a rating of “Basic” or better jumped dramatically — from 68 to 74 percent — as did the number of student receiving higher ratings. Fourth grade math (the blue line): A five-point increase in the average scale score on this exam from 2011 was enough to put Indiana into some vaunted company. Only three other states can boast higher percentages of students who earned “Proficient” or “Advanced” scores than Indiana’s 52 percent. 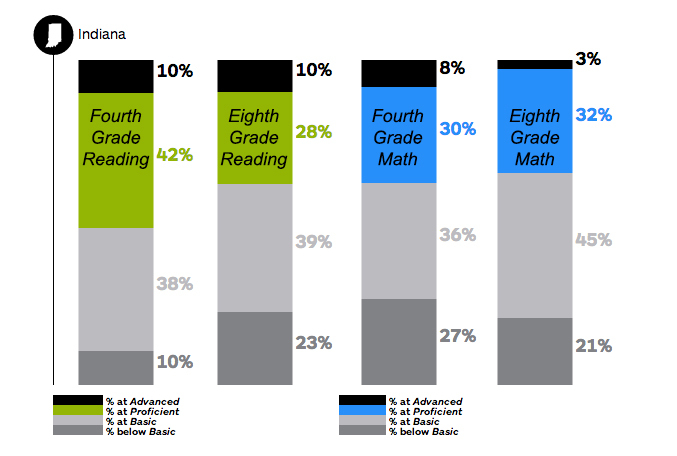 Eighth grade reading (the green line): Indiana’s average score on this test went up three points, but still sits right around the national average, with barely one-third of students earning ratings of “Proficient” or better. 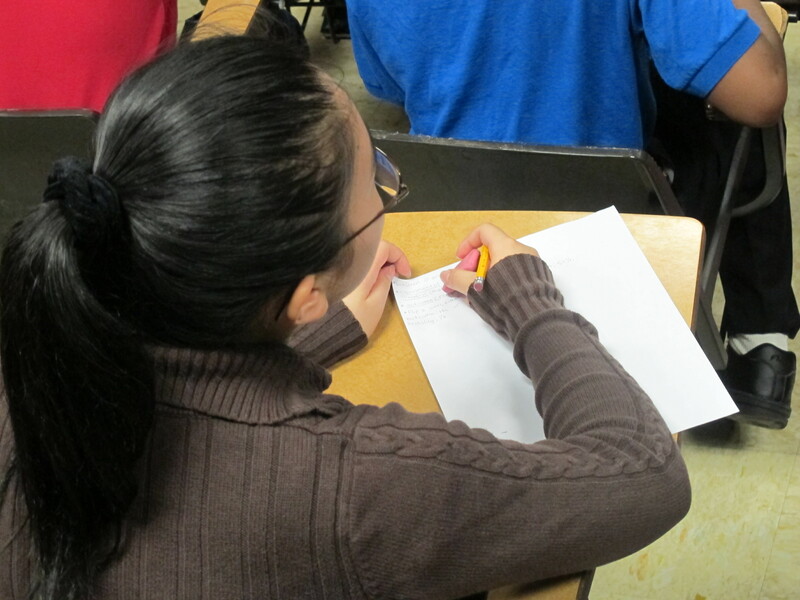 Eighth grade math (the orange line): The number of students scoring “Proficient” or better ticked upward to 38 percent. 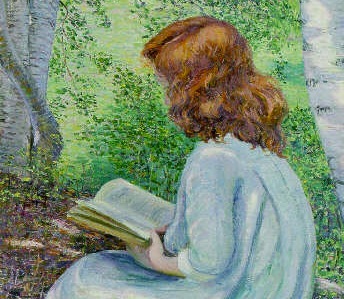 Like in eighth grade reading, the average scale score went up three points from 2011 — it’s now four points above the national mark. Indiana’s achievement gap: The difference in white and black students’ scores remained just as big as it was in 2011; if anything, the gap grew slightly wider. But the achievement gap between white and Hispanic students’ scores shrank significantly — especially in fourth grade reading, where the gap shrank nine points. 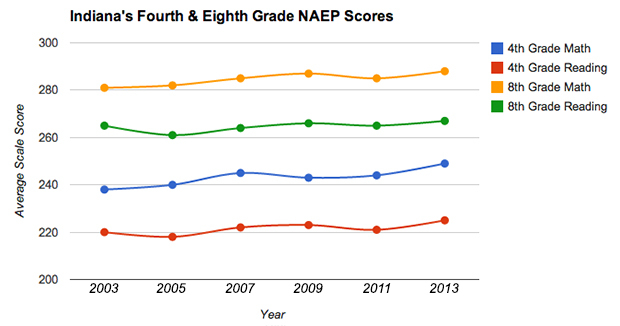 Indiana students' ratings on the National Assessment of Educational Progress. Supporters of Ritz’s predecessor, Tony Bennett, say Indiana’s former schools chief deserve credit for the increase. 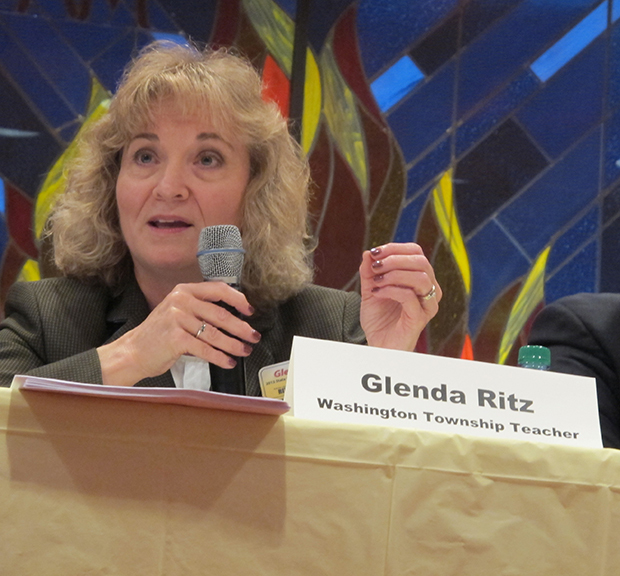 “Ritz and the teachers unions have one objective – undoing the reforms of the Mitch Daniels and Tony Bennett era. Rolling back these reforms means ignoring the simple truth – that they are working,” wrote Cam Savage, Bennett’s former communications director, on the Capitol & Washington blog. What do you make of the results? Let us know in the comments section.